We, Romée Mulder, Myrthe Groot and Sabine Bolk, are happy to invite you to the screening of ‘Wax Print Film’ at the Guave’s studio. Seating is limited so please send an email to connect@helloguave.com to confirm & to make sure you have a seat. Director Aiwan Obinyan will bring a short visit to the Netherlands, so we have the opportunity to not only see her film but also to ask her some questions afterwards. 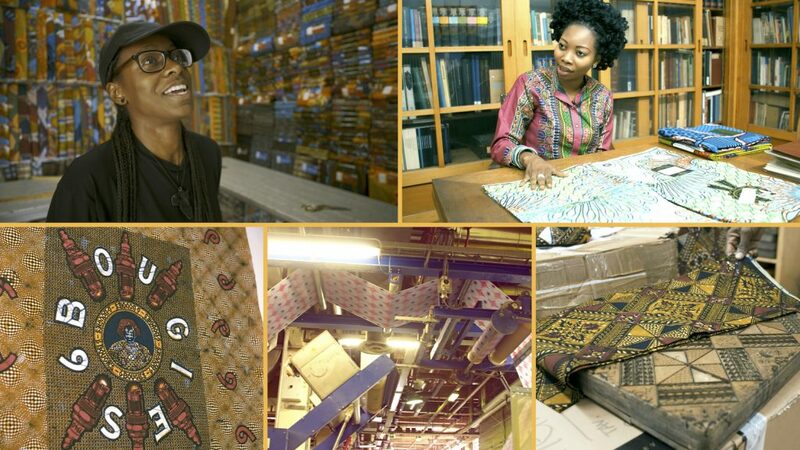 Wax Print is a feature length documentary that traces the global history of a fabric that has become an iconic symbol of Africa and her children worldwide. Surprised to learn from her Nigerian grandmother that ‘traditional’ African wax printed fabrics were a colonial invention made in the UK and Holland, British-born filmmaker and fashion designer, Aiwan Obinyan, sets out on a journey across the globe to trace the two-hundred year history of this iconic textile. From the intricate hand-crafted batiks of Indonesia to the cotton fields of North America and from European industrial mills to the bustling markets of West Africa, the story of how one fabric came to symbolise a continent, its people and their struggle for freedom. I started my clothing line ONOMEN in 2014 using Wax Print fabrics as my foundation and inspiration. When my Nigerian Grandma saw the clothes she remarked ‘Ah, you are using Hollandaise, that’s good.’ I was confused as to why she referred to it as ‘Hollandaise’ and why that was good, and so began a journey to discover the true history of Wax Print and to answer the question ‘is Wax Print African?’. This beautiful two-year journey has taken me around the world, from the Vlisco factory in The Netherlands to the Cotton fields of the USA and from the bustling markets of Ghana to my Grandma’s sewing school in Nigeria. I’ve met with young Africans in the diaspora reinterpreting and reclaiming Wax Prints in bold and new ways and Professors who enlightened me as to the vast and multi-stranded history of this vibrant textile. Wax Print is a beautiful cloth, weaving a tapestry that entwines 4 continents across 200 years of History. I am both honoured and humbled to have undertaken this incredible journey.